Top Level Spring Meadows Condo! Walk into the open and bright kitchen and living area with moss-rock wood burning fireplace, and high ceilings with exposed wood beam, all complimenting this very cute condo. Kitchen includes counter height bar for functional seating and you'll enjoy cooking breakfast and looking out the widow at stellar mountain views! This home is one of only four top level units; these are the only units at Spring Meadows that include additional loft area, perfect for a reading lounge, artist studio, or whatever you fancy! Private covered deck, which faces towards the ski area, offers a great place to enjoy a cold beverage on a hot day! Comes with a ski locker as well as a closet shared with one other unit. 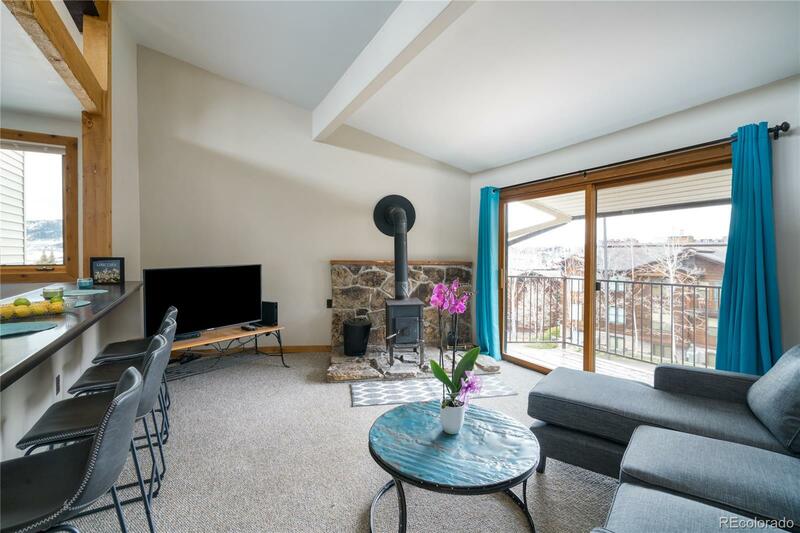 Enjoy the convenience of mountain living with just a 10 minute walk to the base are of the ski area and close proximity to the free ski shuttle.